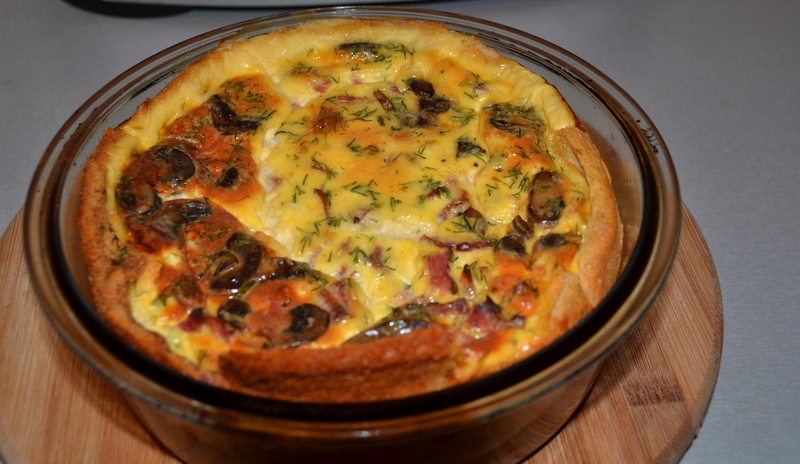 The first time I discovered quiche was a revelation for me… I mean, I had eaten it before, but i had never cooked it. Until last year when I got adventurous – or so I thought. 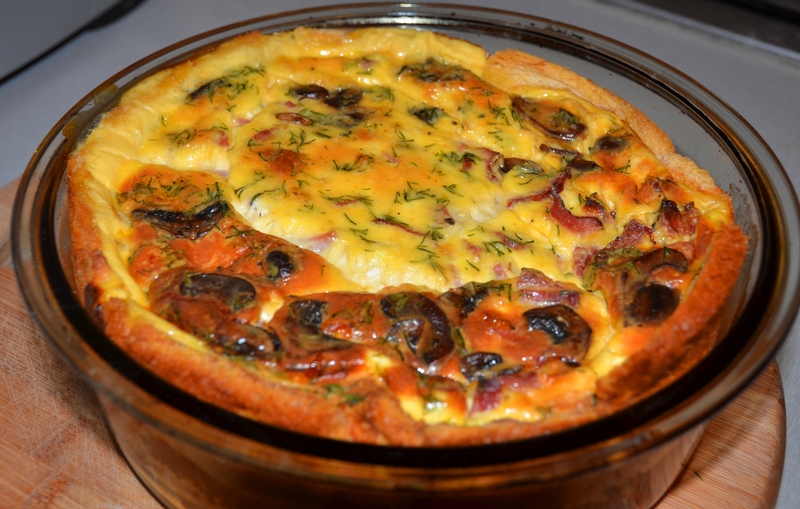 I thought I was “living on the edge”, but, in fact, quiche is so simple it blew my mind – and absolutely delicious! But I soon discovered that my least favorite part about the quiche is making that damn dough. Don’t get me wrong, I make a good dough. 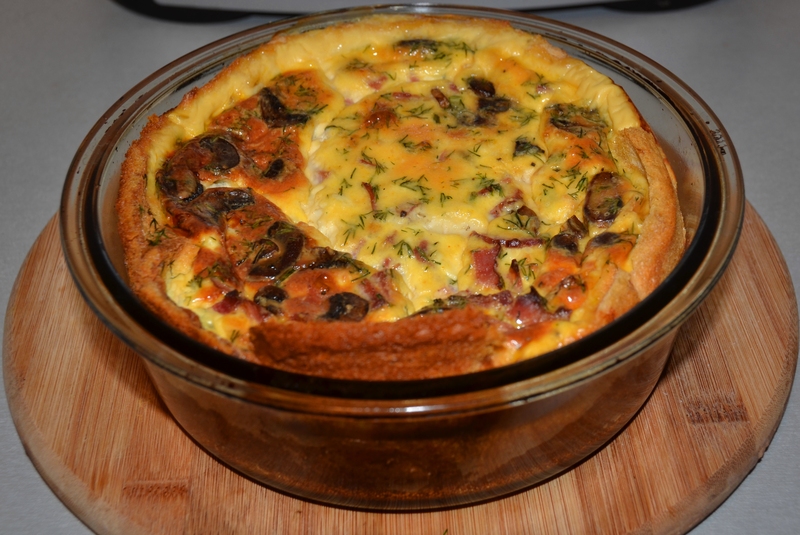 I just don’t enjoy making it when the whole point about the quiche is enjoying a yummy meal that is easy to prepare. Also, you can’t find frozen dough in our supermarkets so that was out of the question. Luckily enough, I recently discovered a solution for the lazy foodie in me. Watching the cooking channel obsessively paid off and I found a neat trick that saves a lot of time – bread. I know, mind-blowing, right? 😀 But let me explain. So in order to make your crust you need to firstly remove the crusts from your slices of bread. Then flatten the slices using a rolling pin. After that, just grease one side of each slice with the melted butter and place them in the pan – greased-side down so they stick to the pan. Be careful to not leave any empty space – you can do this by overlapping your slices – otherwise the filling will just ignore your crust and do whatever it likes. 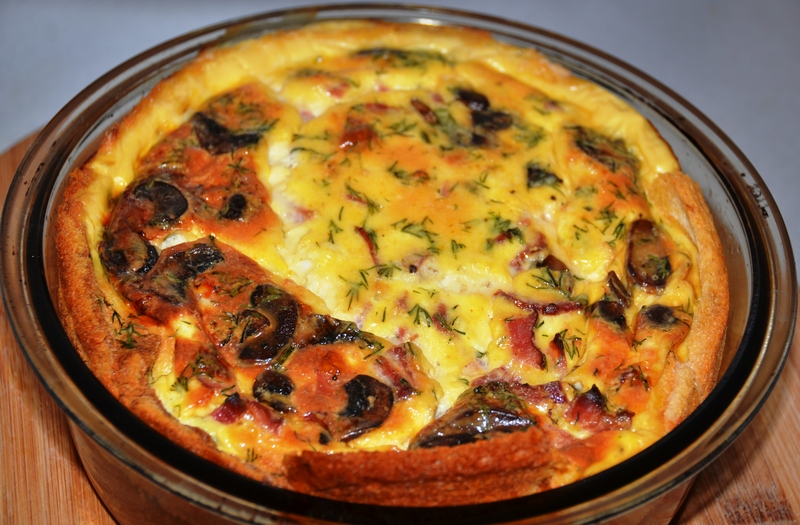 Although I love dill, especially in omelet-type dishes, I advise you to be careful when using it, cause it can quickly overpower your dish and you could be left with dill-flavored quiche, regardless of the other ingredients you used – and it would be a shame. Aaanyway, getting back to the recipe. Just mix the ingredients of the filling together and pour the filling in your bread-covered pan. Put in the oven and leave until it becomes all fluffy and it rises. Because my oven is so nuts and it can turn a 20 minute dish in a 2-hour one or worse – a 20 minute dish into a 20 minute burnt dish, I usually leave it until it’s fluffy and perform the classic toothpick test. If you stick a toothpick into the filling and it’s all clean when you remove it, it’s done. 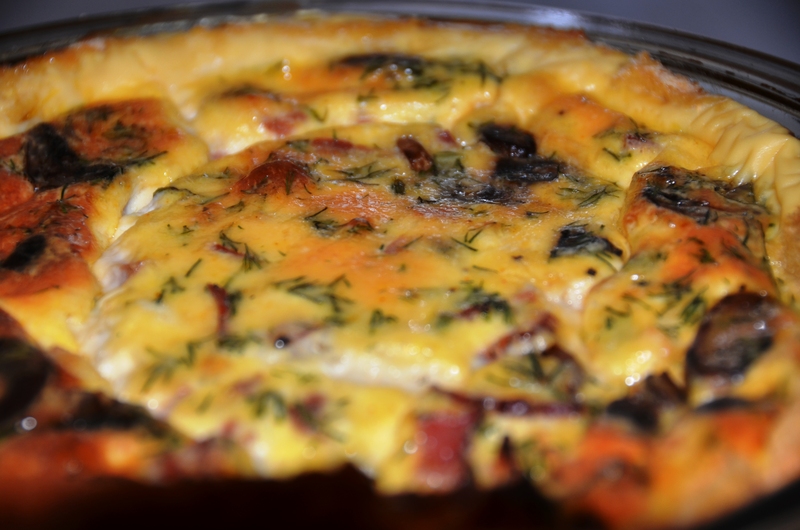 If it has filling on it, you shouldn’t remove that quiche from the oven just yet. Thinking back, I think I usually leave my quiche in the oven for an hour or so on medium heat (although really it’s just low heat in my nuts oven). 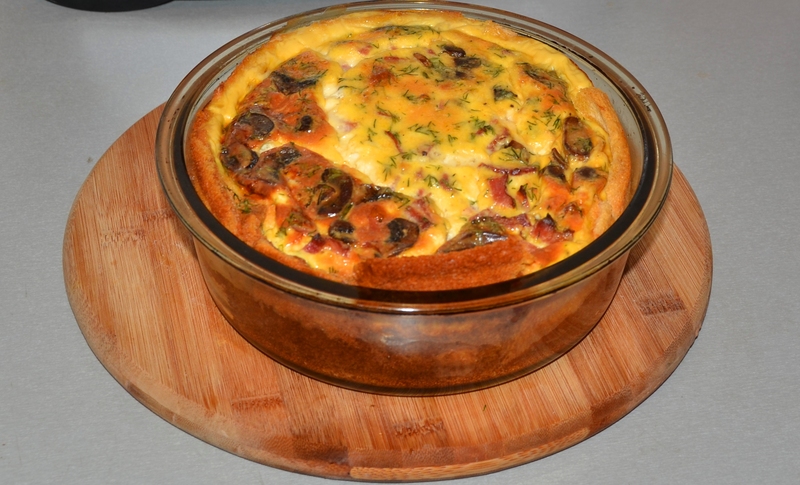 Hope you enjoy and please tell me how it went if you try to make the quiche with bread crust! Looks so tasty! 😀 More bacon! I am LITERALLY drooling. Looks awesome. Just awesome.